The fashion world is not standing still: the emergence of new trends in the design of living spaces; a never-ending flow of ideas from designers all over the world. London, Milan, Paris and New York salons’ present the freshest, hottest trends of creating the most comfortable, practical and effective interiors. 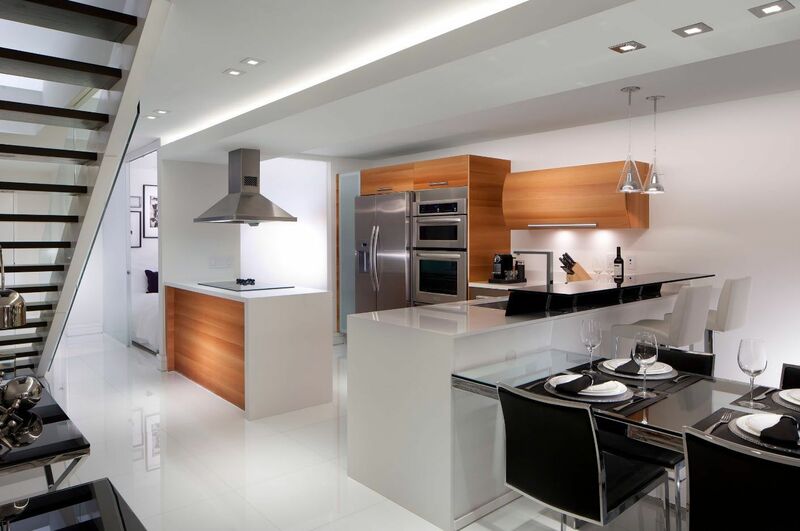 Knowing that thousands of professionals around the globe are working to ensure us using the most modern and technologically advanced materials, devices and appliances for our kitchen spaces, can’t help but inspire. And best thing about all modern trends in design of multifunctional spaces is the popularity of creating an interior with maximum regard for personal comfort. Like in the last season, the main kitchen fashion trends & interior design ideas 2017 of creating a modern design are the use of environmentally friendly materials, the search for the most simple and concise solutions and harmonious symbiosis of practicality and comfort. The modern pace of life dictates features of creation of the most effective interiors. The modern housewife has no time for cooking of overcomplicated dishes with lots of ingredients and longtime laying on the stove. There is no time to polish the silverware, and the instruments themselves have given way to more practical accessory long time ago. The modern kitchen should be not only convenient and comfortable, but also easy in terms of implementation of the simplest workflows to any household, even a child. Therefore, integration of secure, high-tech and energy-efficient appliances into the storage system with the most convenient location and content, is a priority for any designer (kitchen space owner). 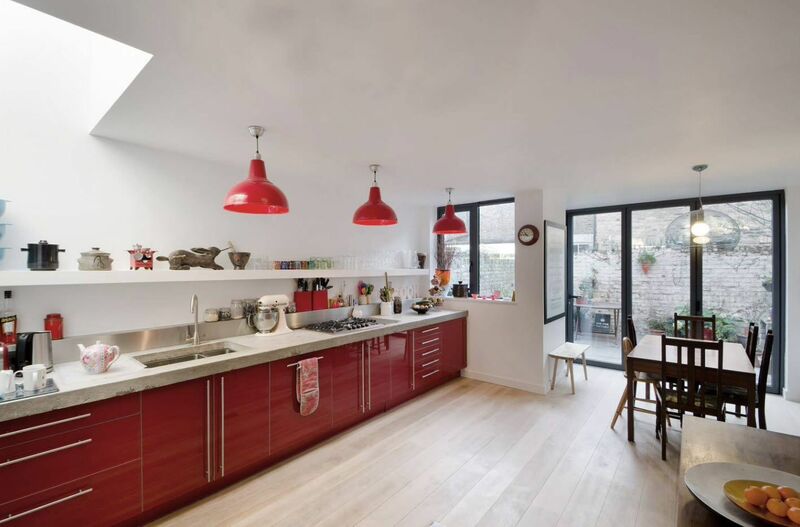 The good news is that the arrange the kitchen area with a high level of visual appeal and effectiveness of ergonomics can be done properly even with a small budget and within a small spaced room. The modern style of the spaces has many faces, but herewith it is succinct. It drew motives from such stylistic directions as minimalism, loft, high-tech, industrialism. But more “homey”, cozy styles can also integrate their concepts in the framework of the modern interior. Country and eco-style, Scandinavian and Mediterranean motifs can be woven into the overall fabric of design of kitchen space. Kitchen 2017 is spacious and bright room with a rational layout, with simple furniture solutions and the most convenient use of all elements. The fantasy can be limited only by modest size of the kitchen itself. That is why the combining of kitchen space with a living room neither lost its popularity, but became a real mainstream. No matter how far stepped progress and the chains of restaurants and fast food, people will nor cease to prepare meals in the kitchen areas for family meals, neither stop taking the closest people at the dinner table. Combining the kitchen and living room together makes it possible not only to expand the spatial capabilities, but also to create a multi-functional interior that can meet the requirements of comfort of all households. Another important feature of combining functional segments within the same premises is the level of natural light in the space. The bigger your windows, the better. 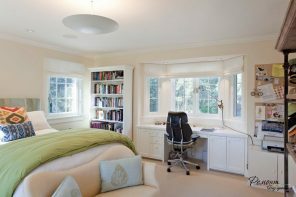 The brighter the available room, the more it will seem visually, the more maneuvers for interior decoration will have the designer or home owner. 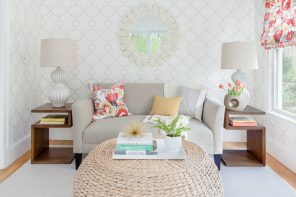 Modern style has always been kind of a mix of the major design trends, borrowed from different stylistic directions. The so-called “intelligent eclecticism” the mainstream of the coming season will be. One style is chosen as a basis (most often it is filled with conciseness and practicality), and it is very reasonably complimented with elements from other style for bringing coziness, comfort and aesthetics. That is the correct dosage of elements of different stylistic manifestations composes the success of created design. Mixing cutting-edge technology and innovative ways to trim intentionally aged elements or surfaces becomes one of the modern original trends. Antique buffet can coexist with smooth facades of modern kitchen set, and the most common finishing can alternate with worn surfaces deliberately peeling paint. 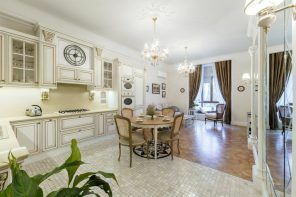 Integration of appliances is no less popular (and it will continue the next season), made in a retro-style kitchen in the room with a modern interior. 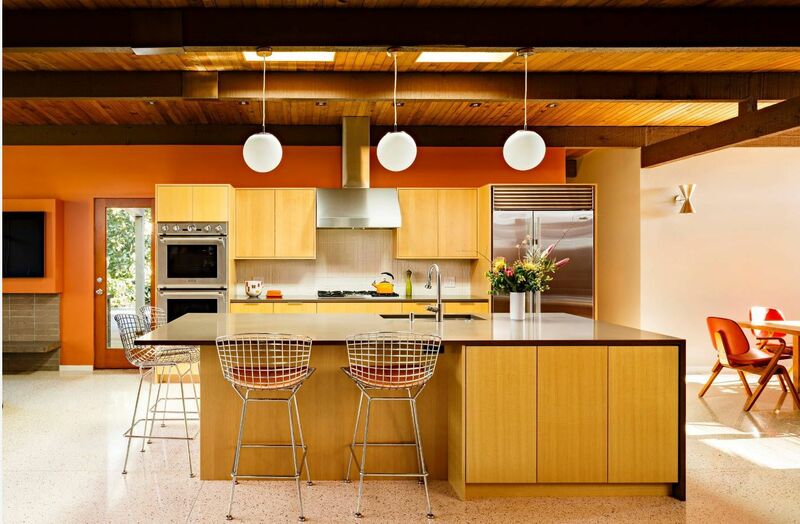 Most often, such vintage retro-appliances with distinctive (and often bright) design are the main accents kitchen design. The fashion for all natural is so firmly entrenched in current trends that will not lose ground soon for sure. You can be confident in buying high-quality finishing materials or furniture items made from natural raw materials. Not only durability, environmentally friendliness and attractive appearance, but also the relevance of interior items will almost always guarantee a high cost. Love of nature obviously embodied in the color trends for the decoration of the most popular room in any home – the kitchen. The motives of the earth, the sea, rocks and vegetation are popular as ever. Designers draw inspiration from natural elements, embodying nice to the eye color motifs in their projects. Their customers appreciate this approach because natural colors always help in creating a special, peaceful atmosphere of the room, the environment in which will be cozy and comfortable for everyone. Let us dwell on some examples of the most popular colors usage. The white kitchen will never go out of style. Symbol of purity and freshness is so tightly associated with the cooking comfort, sterility of all surfaces in our minds that it is difficult to resist the temptation to design the kitchen space in all shades of white. But not only the lightness and freshness attract designers and their clients. White tone is universal, it goes well with any color decisions. Not to mention the fact that all white shades go perfectly in order to increase the visual volume of a small space. The white color helps to create a feeling of space even in a small room. Sunlight reflected from the white surfaces, freely spreading throughout the room, creating a light image of the space where freedom appears as most natural interior member. In order to bring a color accent into the white-based kitchen design, you do not have to be a designer. Colorful furniture or any other items of the interior of any color looks accentual on the white background. But totally white kitchen will look sterile, too lightweight and not cozy. The ideal way of bringing natural warmth, comfort and a sense of comfort into the snow-white kitchen design is the use of wooden surfaces. Any type of wood, even the brightest ones, will look as visual emphasis on a white background. Such an alliance is always looks advantageous in the complex with modern appliances. Snow-wood ensemble looks organically even in a modest-sized rooms. Kitchens made with contrasting color combinations do not leave their positions in the list of the most popular design projects either. Most often, designers offer to oppose snow-white surface and the inserts of dark gray, dark chocolate and even black to each other. Any of the colors wenge shades will look great in combination with a light finish or snowy tabletops. To avoid too straight kitchen image contrast experts recommend to “dilute” black and white alternation with wooden elements. It can be both as kitchen units’ facades so as worktops, furniture for the dining area and even room’s finish or part of it. The use of various shades of gray to create a practical, functional and at the same time visually appealing image of the kitchen do not go out of fashion. Neutral shades are good because even non-professionals will be able to cope with their combinatorics. Grey shades can be combined with wood, have always advantageous look in combination with white tones and dosed splashes of bright color. Design in gray tones is not only comfortable for our sight, but also favorable for the creation of a neutral emotional background of the room in which every household or guest houses will be able to feel comfortable. No matter how much time had passed, whatever innovations and advances happen in production of finishing materials, but a special microclimate of kitchen space dictates its own criteria of the materials selection for the design of multifunctional room surfaces. Constant changing of temperature conditions, high humidity in some areas of the kitchen space and possible mechanical impacts complicate the choice of finishing materials, putting practicality and functionality at the forefront. But modern technology allows us to choose the options for the kitchen surfaces without sacrificing aesthetics, environmental friendliness and usability of materials. Finishing of the modern design projects of kitchen spaces acts only as a background for the main participants in the interior – furniture set and dining group. Decorating the walls is most often performed in one-color scheme. Neutral light shades can be mixed with a dark contrast, but the use of the print is considered irrelevant (at least, when the kitchen design is carried in modern style). Given the fact that harmful (or even slightly suspicious) materials for human’s health are taboo for interiors 2017, natural raw materials are in the foreground. Many designers using cork for decoration of modern interiors. This is an easy, warm and eco-friendly material with its original texture, which is not affected by the painting. The use of cork coverage is quite able to replace the use of decorative plaster. Besides, it is easy to apply. Concrete surfaces (or their effective imitation) does not hand over their positions, and continue to be popular among designers and their clients. Even a small concrete surface gives a light touch of the industrial (and therefore modern) style to the kitchen interior. Gray concrete color can be called the most neutral. It blends easily with any variants of colors finishes and furniture. Modern furniture set is a symbiosis of brevity, practicality, ergonomics and aesthetics. Whatever the design of furniture has been executed, it has to be functional, ultimately convenient to use and easy to clean. Modern mechanisms, the latest developments in the field of furniture accessories allow you to create a comfortable storage systems even in tight spaces by rational using of every centimeter of the kitchen space. The use of ready-made furniture solutions for the kitchen space is significantly inferior to the popularity of kitchen set production by individual order (and sizes). It is due to the features of apartment layouts of the last century buildings’ and a lack of square meters coupled with the natural desire of customers to obtain furniture solution that will fully meet their storage needs, the integration of household appliances and distribution of the working surfaces. Trend of a completely smooth facades has been faded a little bit. Growing number of brands manufacturing ready-made solutions for the kitchen furniture prefer to use the findings. But smooth facades are still a symbol of modernity for many designers. So, we can only hope for our own intuition and taste preferences when selecting the best option for the execution of the facades of the kitchen. Another trend this and the future season is the use of open shelves for storage as an alternative to the upper tier of the kitchen cabinets. Such an approach would prevent the creation of a “box” effect in small space. It is when a small room is entirely filled with storage systems, which visually push with all their capacity on present people. Combination of wall cabinets and open shelves is most commonly used for a large kitchen space. 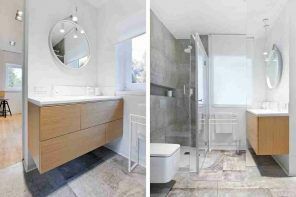 An interesting design and a practical component bribe many homeowners and designers. If we talk about the selection of furniture for the organization of the dining area, the universal solution, which might be called mainstream, does not not exist. Furniture for dining segment is selected based on the capabilities of the room, the number of family members and lifestyle features. Some people need to cater a few people at the table every night for a family dinner, other people confine with the bar or kitchen island countertop to locate the pair. If the kitchen area has enough space for the organization of the dining area, experts recommend the use of round or oval tables. This form allows you to add not only some seats in case of need, it also does not interfere movement inside the kitchen and is safe for home with small children, and also looks attractive and homelike. Rectangular and square tables for meals are not less popular – everything depends on the geometry of the main type of furniture – kitchen unit. But most modern manufacturers began to round the corners even in these pieces of furniture. If your family is not more than three persons and loud feasts is not your thing, so the small area for meals, organized on the extended kitchen island’s countertop or peninsula, will be enough. Such dining area is compact and can be carried out in very original way. You can bring originality and creativity to the kitchen interior with the help of the unusual bar stools or tabourets. In modern design projects decoration is kept to a minimum. The tendency to reduce the number of elements that carry only a decorative function is particularly visible in kitchen spaces. In an environment where you need to arrange a large number of storage systems with embedded appliances, to organize the work surfaces and dining area on small number of square meters, there is a risk to create the effect of clutter by too active using of the decor. Therefore, quite functional furnishings as lamps, utensils, cookbooks, live plants and fruit are often used as decorative elements. 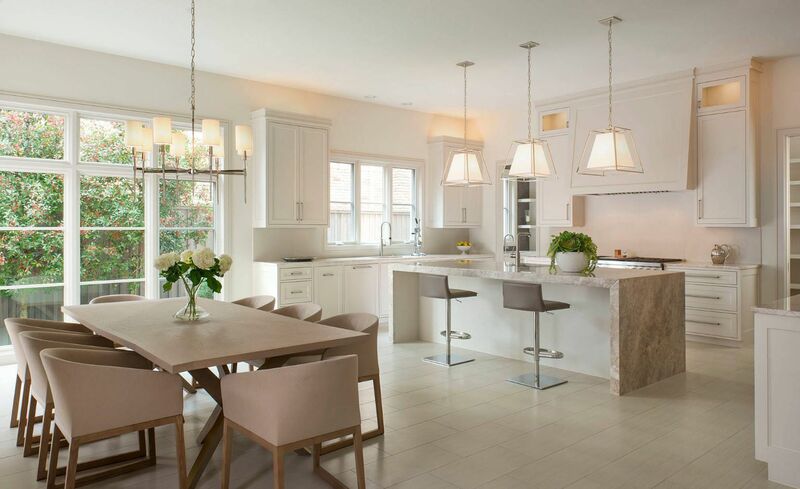 In the most concise and functional kitchen design projects lighting fixtures are often the only bright, accent or original features, which able to stand out from the crowd and attract attention and even dictate the occupancy of zone around them. A clear, prominent spot on a completely neutral background of modern kitchen interior can appear mottled upholstery of the kitchenette or a small sofa, a tablecloth on the dining table or piece of furniture itself. You can choose a colorful upholstery for chairs or stools, no matter how your dining area is organized – with a table, a kitchen island or bar counter. Designers pay special attention to kitchen accessories, and therefore manufacturers of various accessories strive to provide as many options for the modern, practical and aesthetic equipment for this multifunctional space as possible. For example, mixers have long ceased to be simply taps for water supply. This modern tool helps save water and clears it. Herewith, they may look futuristic, equipped with backlighting and striking gloss chrome-plated surfaces, or to be executed in the spirit of an ancient copper or bronze plated, carved gates, and luxurious decor.